A lot of people and religious groups believe that being good equals a free ride to heaven. That if they do good and are good they will go to heaven. But who really knows if that is true or not. 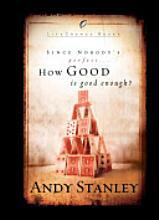 Like the title of this book, “how good is good enough”. How will we know if we will make it to heaven. This is what Andy Stanly discusses in this book. This book is small and could be read in 2 hours and would be good for new believers or people who want to grow stronger in their faith. Andy Stanly holds the reader in suspense by not giving you any clear answers until toward the end of the book so it make you want to keep reading.